Sébastien Riffault cultivates his 12 ha vineyards biodynamically and vinification is totally free from SO2 and any other chemicals. "Étienne et Sébastien Riffault" label has been produced since his father's generation. From the 30 years vieilles vignes on Argilo-Calcaire soil, fermented in stainless tank(3 months) and aged for 24months "Sur Lie". This is a top quality Sancerre in modern style. On the other hand seems Sébastien expresses much unique style with "Sébastien Riffault" labels. But in fact this is the original style of Sancerre. 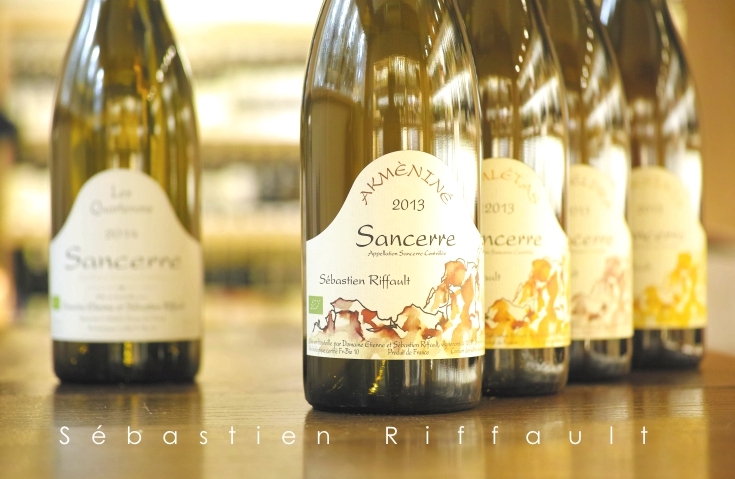 Sébastien has precisely revived Sancerre a century ago. These wines are made from perfectly mature grapes from old vines and it contains botrytis. Aged in old barrels for long time, and bottled without fining and filtrations. Its taste is out of standard of today's Sancerre and the wine possesses impressive natural concentration and ripe fruits - Indeed, it is easy to understand why these wines are much sought-after from natural wine bars in Paris and fine and creative restaurants in the world such as "noma". The wine has excellent sensitivity, full of energy and the soils are expressed straightly. Perfectly ripe 100% Sauvignon blanc from over 30 years vieilles vignes on Argilo-Calcaire(chalky-clay) soil. Contains 30% botrytis. 24 months ageing "sur lie". No SO2 added, bottled without fining and filtration.